Nuaire DIY Kits Nuaire, the UK market leader in energy-efficient domestic and commercial ventilation solutions, combines innovative products with world class performance in quality, delivery and service. Nuaire fans are used in all types of commercial and residential buildings, infrastructure projects and numerous applications by original equipment manufacturers in the UK and around the world. Nuaire is a British organisation that has been designing and manufacturing products for home and overseas markets since 1966, and in 2015 became part of Polypipe Group plc. Its products are now available in over 40 countries. Nuaire has extensive resources and is constantly growing, employing over 450 people worldwide. The most powerful unit of its size available today, the MRXBOX95-WH1 is a compact but high duty wall-mounted MVHR, designed specifically for medium to large houses and apartments. With up to 95% efficiency, this low-energy whole home ventilation system will help you achieve Code and a high SAP Q score, whilst providing high performance ventilation for up to seven wet rooms. 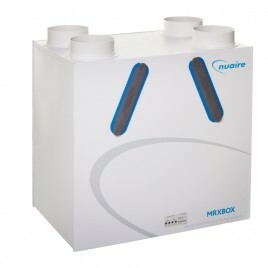 Click here for full MVHR range. The MRXOX95AB-WM2 is designed to provide good quality, balanced ventilation for medium-sized new build houses and apartments, and desipite a low Specific Fan Power (SFP) offers high performance and therefore helps you gain a high SAP Q score. It includes an integral humidity sensor which will automatically boost both the supply and extract fans when the humidity exceeds a pre-set level. It is also designed to be compatible with the latest generation of controls and sensors. The MRXBOX95AB-WM1 has all the attributes of the high quality MRXBOX95-WM1, but also features an automatic summer bypass fitted as standard, as well as the ability to commission the supply and extract fans independently on both minimum and maximum speeds. This allows the unit to provide the perfect ventilation for the environment in which it is placed. This is a medium duty unit, ideal for small to medium sized houses and apartments. It is compact, low profile and simple to install, providing the perfect solution for a wide range of properties. The MRXBOX95AB-WH2 is the highest duty MVHR unit in the range, and will provide balanced, optimised mechanised ventilation, with up to 95% heat recovery. It is designed for the largest properties and will provide comfortable air with excellent energy efficiency, helping you to achieve a high score on SAP Appendix Q. The new MRXBOX95-LP1 offers the lowest specific fan power of any low-profile void-mounted MVHR system available. Specifically designed to fit easily into apartments with ceiling void restrictions where space is at a premium, this space-saving MVHR system will free-up valuable storage space and give designers greater flexibility due to its very low-depth - just 200mm.